This first week of the 30 Days of Lists project has been great fun. 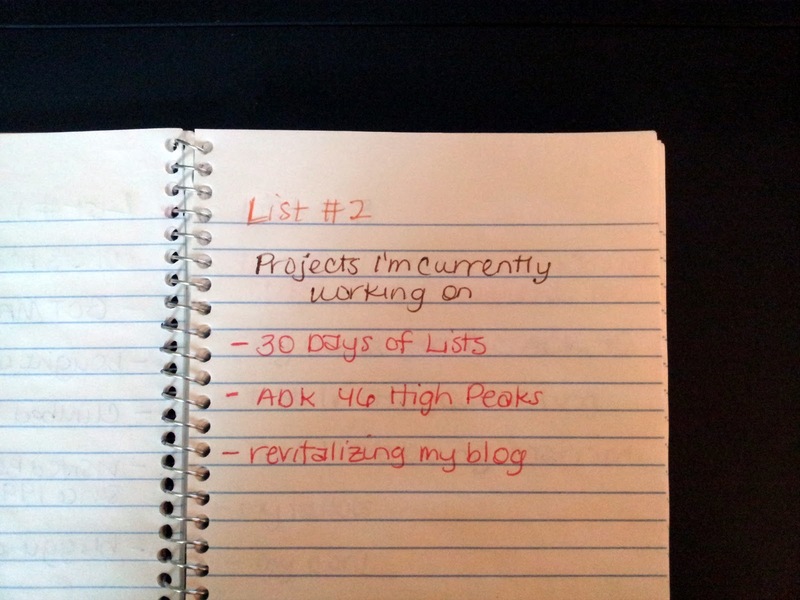 I've been reading the prompt first thing in the morning and writing my list immediately. 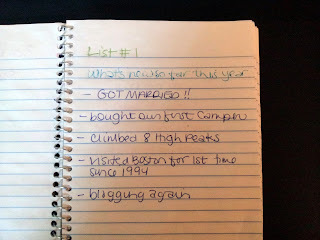 Yesterday I waited to write my list for obvious reasons (obvious when you see the list topic). I am not at all crafty, nor do I do any kind of scrapbooking, and I do all of my journaling in inexpensive spiral bound, wide-ruled notebooks. 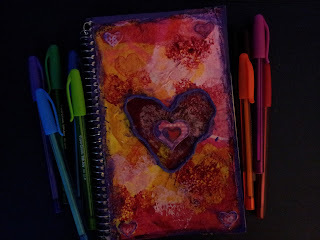 I decided to take advantage of a small notebook that my mother had decorated and mailed to me. I picked up a pack of 10 colored ballpoint pens at the drugstore and voila! Ready to list! 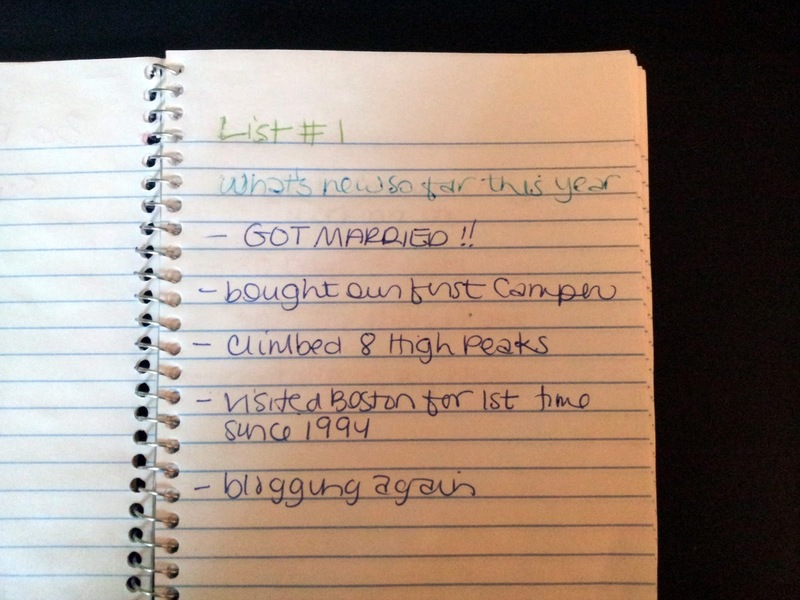 List #1 came out while we were hiking Algonquin, Iroquois, and Wright, so I had to wait to see what the first list prompt would be. I wondered about it while hiking but had to wait until we got back to the camper, where I showered and then we went out to eat. 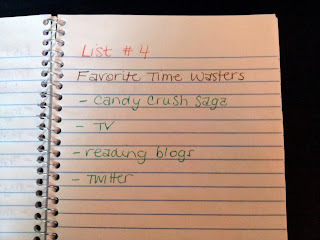 So it was late and I was exhausted by the time I got to do my list, which I can see in my handwriting. 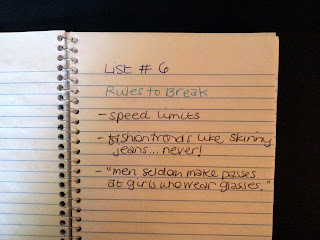 With list #2, I got into my morning routine. 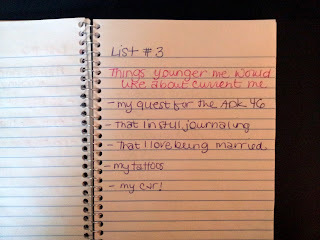 List #3 challenged me more than the first two, and I continued to add items throughout the day. 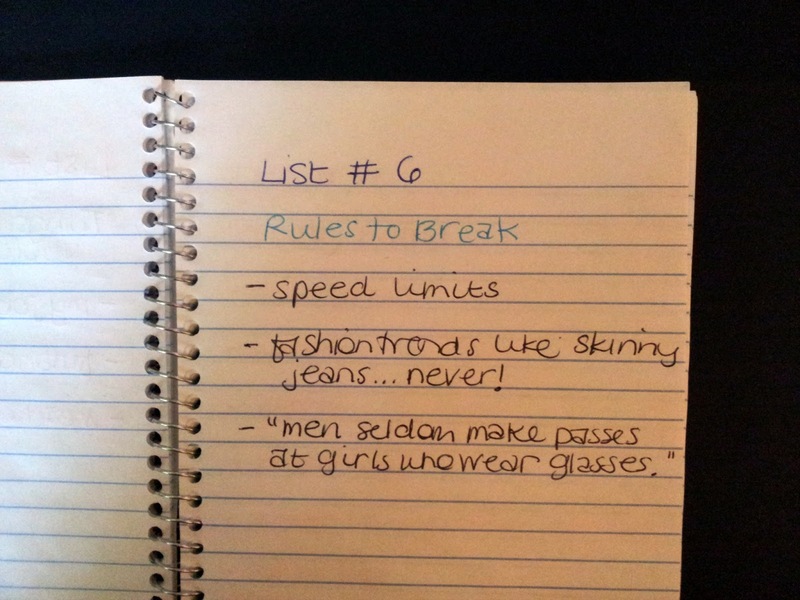 List #4 was easy. 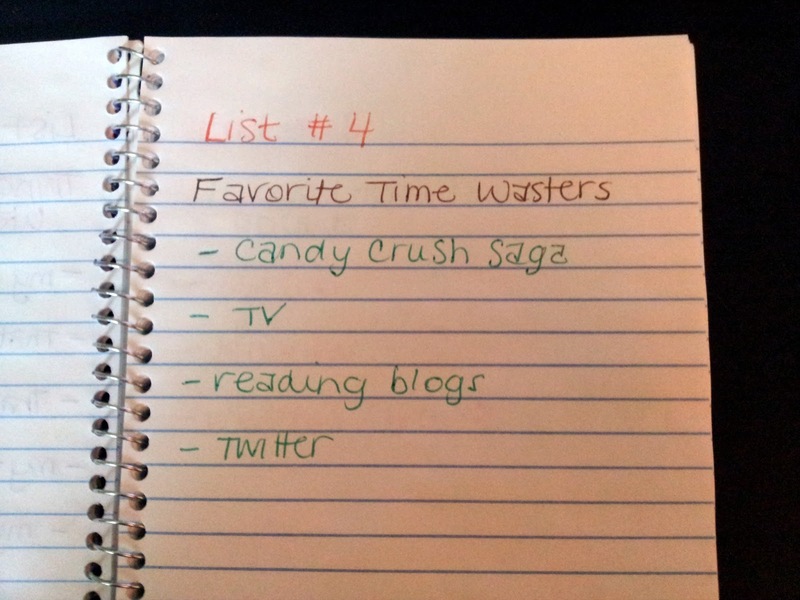 I have lots of time in my life right now that I have to fill with "time wasting" activities. Some of the other listers objected to the topic for list #5 because they wanted to keep their lists upbeat. As I've mentioned before, I am not an optimistic person, so this didn't bother me at all. 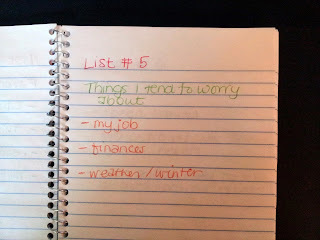 I am, however, a HUGE worrier. I have a very anxious personality. If I'm awake, I'm probably worrying about something (in fact, considering how poorly I sleep, I'm probably worrying then, too). I decided to keep my list short though and not go into the gory details. List #6 was a head scratcher for me. The first item was a no-brainer, but then I really had to dig deep. 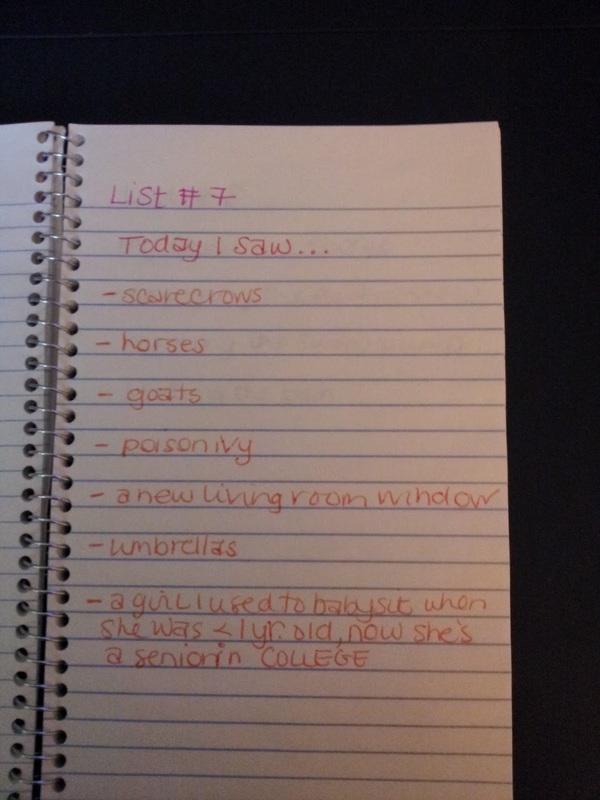 After I'd finished my list I looked at some of the stuff people posted in the private Facebook group and saw some great ideas that I wished I'd thought of. 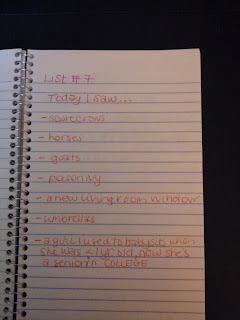 List #7 was the one I decided to wait to write until later in the day. My sister and I took her son to an annual harvest festival for his first time, which provided most of the items for my list. There are no rules for this project. The idea is for everyone to make it their own in order to get the most out of it. Some people choose to look ahead and complete their lists in advance, but one of my favorite parts is waiting and reading each prompt for the first time each morning. That way, I get to enjoy the surprise every morning, and then I can focus on just one topic each day. I'm definitely looking forward to the rest of the lists! They do it twice a year, so maybe you can do it next time (March).